Since I announced Banger Does Britain a couple of weeks ago, the debate and conjecture has raged, okay, murmured, about what the ‘banger’ in question was to be. The Twittering classes have chatted in wonder. Pubs rumbled with guesses in a way they haven’t done since Andy Gray began his vociferous campaign for female officials in football to be even greater in number. I even hear on the grapevine that betwixt tossing of burgers and twirling of sausages, Obama and Cameron waded in with their thoughts at the Number 10 barbecue. 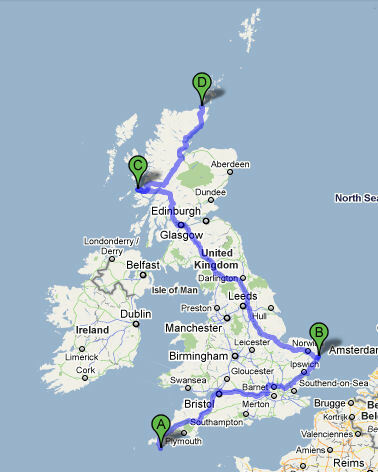 To refresh your memory, Banger Does Britain is a visit to the four corners of Britain (Lizard Point, Lowestoft, Ardnamurchan and Dunnet Head) in no more than 24 hours, inspired by previous runs by Phil Llewellyn and Keith Adams. 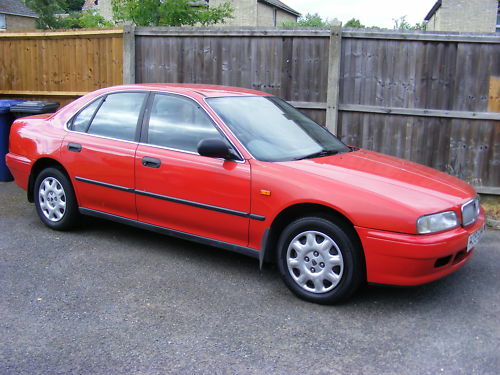 However, in celebration of Keith’s work at aronline.co.uk and James Ruppert’s Bangernomics theory, I decided to do my version of the run in a £500 car from the Rover Group stable of brands. I wanted to keep costs down as much as possible so intended to keep the distance to travel for a potential set of wheels to a minimum. I quickly realised from a relatively quick scout of eBaymotors and AutoTrader that there wasn’t a lot to be had locally that would fit the bill. This in part was due to Lincolnshire not being the epicentre of motoring but also because of the much vaunted scrappage scheme that had encouraged many owners of roadworthy and suitable cars to have them crushed in exchange for a sizeable deposit on a brand new car. Romantic notions of something classic or with rarity value were soon dashed too. My first eBay bid went the way of a 1981 Maxi but it wasn’t a surprise to see the auction shooting well above my £500(ish) cap. And so it continued. Searches for Princesses, Ambassadors, SD1s, Maestros and Montegos all suggested the same thing: they could be had for £500 but I wasn’t confident they’d manage four streets, never mind the four corners of this sceptred isle. The ones that did look mechanically up for the challenge were well into four figures. Make sure you’re sitting down – I even saw a Montego up for £3000. See, I told you to make sure you were sitting down. So, a degree of sense took over. Not completely, or I’d have abandoned the idea, but enough to engage concentration on 1990s Rover Group products. The Honda Concerto-related Rover 200/400 Series looked obvious in terms of choice and were constantly under consideration but a lack of any suitable ones locally, with healthy MOT lengths and less than starship mileages, meant they never got much beyond the idea stage. The next logical choice was the revitalised Metro and later 100 Series Rovers. Now, these were more frequent in number and were often owned by sedate pensioners for pootling to the shops once a week. And my, there were plenty with low, low miles – several under 30,000 yet well over 10 years old. More than too many were troubled with the usual Metro blight of rusting rear wheel arches but I found a couple that were no more than surface bubbles and would have been great. So why no bids? 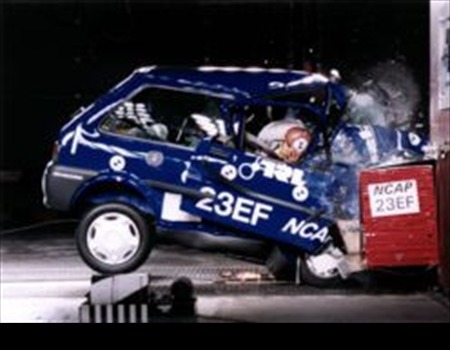 It’s daft really, but I kept thinking of the picture below, where the 100 Series was panned by the chaps at Euro NCAP for an appalling crash test performance in 1997. The thought of doing such a long journey over a short space of time in something with little more crash resistance than a wet cardboard box haunted me. It’s daft because I’d considered older and less crash worthy cars before I’d considered Metros, but the difference is I’d seen what a folded Metro looked like and it wasn’t pretty. So, that just left the larger models in the range – the 600 and 800 Series. Dealing with the larger first, you may recall from elsewhere I have a silly soft spot for these, especially in Sterling coupé guise. I even like the crisp and angular original. Funny how they blended into the background when new yet now they look razor sharp and interesting. Again, the price/condition conundrum blew any chances. Therefore, by default, the 600 Series became the focus of my attention. Plenty around still, generally well built, marrying the best of Honda’s (at the time) refinement in the mid-sized sector with Rover’s then re-emerging curvy style. Generous offers of a couple of rorty 620ti models requiring a little TLC came my way but I had to forego them as I sought more of a turnkey solution. Anyway, today one stepped up to the plate. And so, at last, ladies and gentlemen, I give you the Banger of Banger Does Britain. Mid afternoon, I became the winning bidder of a cheery looking 620Si, paired with a relaxing automatic gearbox (okay, maybe not the best choice when a decent amount of economy will be needed for the run, but easy for cruising and dealing with the inevitable stop-start traffic jams). All this for the tidy sum of £511. I’ll be collecting it later in the week. So, what do you think? Apart from ‘banger’ is a bit harsh a name for it.